Open up a new world of creative filmmaking possibilities! The innovative ME20F-SH full-frame Full HD video camera delivers ultra low light performance and infrared capability at an unrivalled sensitivity of over ISO 4 million. A special, newly developed full-frame 35mm 2.26 Megapixel CMOS sensor is designed specifically for low light video capture. With larger pixel sizes the sensor maximises light-gathering capabilities to deliver ultra low light images with low noise. Thanks to a maximum ISO in excess of an unparalleled 4 million (+75dB) the ME20F-SH can see and shoot in almost complete darkness at less than 0.0005 lux. In other words you can shoot a night sky with confidence even when it’s lit purely by starlight (with an f/1.2 lens at 29.97p and maximum gain). The ME20F-SH is able to clearly see and identify colours, even in extreme low light conditions and high gain settings, plus it has the added advantage and ability to capture infrared (IR) in colour too. The ME20F-SH can produce a Full HD 1080p/720p output, that can be recorded via an external recorder, with Full HD 1080p/720p 4:2:2 available via the camera’s rear 3G/HD-SDI or HDMI outputs. For superb freedom in post-production Canon Log Gamma captures the maximum range of tones, providing up to 12 stops (800%) of Dynamic Range. Widening the Dynamic Range by up to 12 stops enables the extremes of highlight and shadow details to be captured, thus extending the scope of colour grading. Wide DR mode also captures 12 stops of Dynamic Range but outputs great colour and skin tones, without the need for post-production. 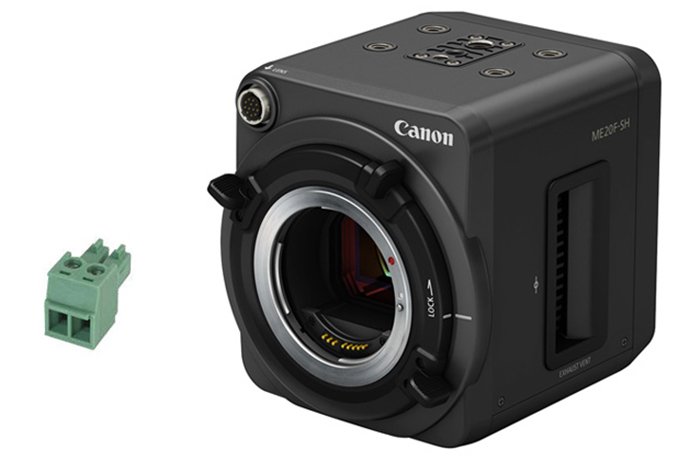 Canon Log is most useful when greater control or more extreme post-production work is required. The ME20F-SH features reduced motion blur with support for frame rates up to 50p/59.94p for capturing slow-motion footage. Canon’s DIGIC DV4 processor provides enhanced image reproduction, supplementing the strengths of the DIGIC DV family – such as smooth gradation and faithful colour reproduction – with support for recording at higher data rates. The sensor and processor work together with the RGB processing system to ensure reduction in both moiré and aliasing, resulting in cleaner, sharper images. The ME20F-SH is easy to set up and use, with a range of automatic modes including shutter priority (Tv), aperture priority (Av) and auto gain control (AGC),* as well as Auto White Balance and One-Shot AF. Crucially, manual control is always available, giving you creative control over camera settings when you need it. The camera’s Custom Picture menu offers a variety of options that control various aspects of the image produced. You can save up to six custom pictures files in-camera for later use or use one of three preset Custom Picture files (Canon Log, Wide DR or EOS Standard). The ME20F-SH offers a mind-boggling ISO range from 800 (0dB) to over 4 million (+75dB), which allows filmmakers to shoot anything from daylight conditions right through to ‘starlight’ conditions at night. Fast and easy remote operation of the ME20F-SH’s built-in, electronically controlled ND filters (3-stop and 6-stop) and IR cut filter is possible via the compatible Canon Remote Controller RC-V100. Featuring an EF mount with Cinema Lock the ME20F-SH supports a wide selection of compatible lenses across the Canon optical range, including zooms, primes and selected Canon Servo lenses* (with a 12-pin interface) for greater control and creative shooting opportunities. * A list of compatible lenses to be confirmed. The ME20F-SH features multiple connection options for a monitor and output to an external recorder, including HDMI out and two 3G/HD-SDI terminals. Multiple remote control terminals are supported by an 8-pin (RS-422) interface and a 2.5mm jack socket for the Canon Remote Controller RC-V100 (the RC-V100 may need a firmware update). The ME20F-SH also offers genlock support via a rear terminal thus allowing for syncing with other devices. The ME20F-SH is a compact and lightweight camera that weighs just 1.1kg and measures approximately 102x116x113mm (wxhxd). It’s ideal for low light location work, whether on land or underwater. With both bottom and top mounting points the ME20F-SH provides the flexibility for easily positioning and mounting on to robotic heads, brackets, cranes and tripods; thus effortlessly integrating into location workflows. It’s quite simply a unique, multi-purpose camera for almost any lighting condition. Expert, in-depth coverage: discover all you need to know about the astonishing Cinema EOS range. Click through to find out your nearest authorised Canon centre for camera and lens service and support.